The average Jo'burger would have to work 291.9 hours to pay for an iPhone X, according to data from UBS Bank. That adds up to everything earned by one person, on average, in just under 7.5 weeks, if they worked a standard 40-hour week. 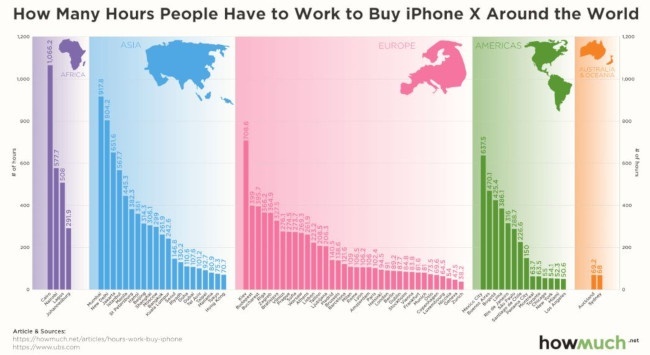 Earlier this year, UBS analysed data from cities across the world to work out how long people would have to work, on average, to afford an iPhone X in each city. They took average incomes from various professions across sectors, ranging from bus drivers and carpenters to product managers, teachers and doctors. Then they analysed the price of an iPhone in a given city and compared the data. Money website Howmuch.net produced graphic representations of the data, saying it pointed to a dual inequality. "The most interesting fact about our visualisation is how it demonstrates inequality both within and between continents," they said. "In Europe, for example, most of the cities on the left side are in the East, and most of the countries on the right are in the West." 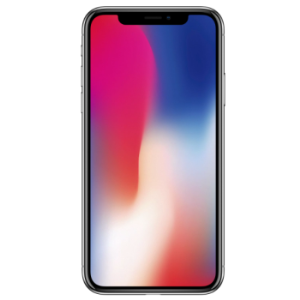 In the Americas, workers living in North America could afford an iPhone X more easily than workers living in Latin America, they added. Apple's brand "appeals to people living in advanced economies, where there's plenty of Wi-Fi and 4G LTE networks," they said. Further, they argued, the average person has to work days or several weeks to get an iPhone. "A lot of people get a new phone each year, so […] in all likelihood, Apple will get the equivalent of months of labour over the course of each person's lifetime." "It's 2018 and finding someone who doesn't own a smartphone is like finding someone who lives under a rock. "In fact, were René Descartes alive today, he'd probably rephrase his proof of existence: iPhone therefore I am," UBS said of its index, calling the iPhone a "representative product". ICT and mobile technology expert Arthur Goldstuck, however, told Fin24 that the iPhone index was a limited measure. "It seems ironic, at first sight, that some of the world's most expensive cities require the least hours of work to buy an iPhone, whereas the cities that require the most hours are all in emerging markets, and therefore in countries with dramatically lower incomes," he said. However, he said, the "correlation does not equal causation". "The more relevant correlation would be with incomes in these cities: the more expensive cities also have higher average incomes per hour, whereas cities in emerging markets all have lower average incomes per hour. "This must then be related to the dollar exchange rate in each country, and the resultant local price of the product." Setting the base price in local currency higher than one would expect at the lower ends of exchange rate cycles safeguards distributors against making a loss, he said. The small sample of professions was also a limitation, Goldstuck argued. "For a true reflection, one would have to look at wages in specific sectors and at different seniority levels. "For example, people in investment banking in South Africa would probably have to work a substantially lower number of hours than the average." The iPhone index was "fascinating" and a "novelty index", he said, but with "little relevance to emerging markets aside from highlighting the gap between these and developed markets". It was a "very poor tool for measuring income disparities", he explained, due to the iPhone's high cost and the fact that it was out of reach for the vast majority of people in emerging markets. "The truth is that various United Nations measures and benchmarks give us far clearer, more precise, and more usable tools for addressing inequality," he said.